Forex Trade Idea: Long-Term NZD/JPY Selloff? I know, I know… I missed out on a lot of pips with this ongoing NZD/JPY selloff, but I’m seeing confirmation on the daily forex time frame that further losses are likely. Do you think it’s still worth shorting at this point or is the move overdone? 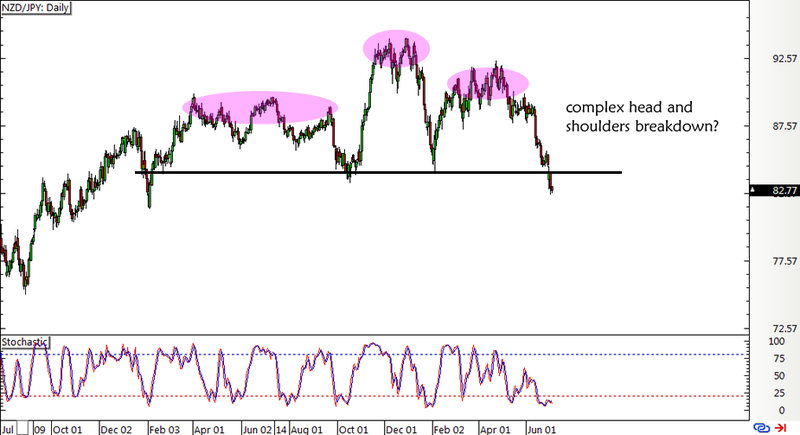 I’m seeing a complex head and shoulders pattern on the pair’s long-term chart, with price just recently breaking below the formation’s neckline. Now this pattern is more than a thousand pips in height, which suggests that the resulting selloff could last by the same amount. From a fundamental standpoint, there are still a lot of factors pushing for more Kiwi losses. For one, the latest dairy trade auction in New Zealand chalked up another decline in prices, carrying on with its negative streak since mid-March. This could spell downbeat prospects for the country’s trade figures, potential downgrades for milk payouts to farmers, and possibly another RBNZ rate cut. As for the Japanese yen, BOJ Governor Kuroda previously mentioned that the currency has already corrected its excessive gains in the past three years, which suggests that the central bank is no longer interested in implementing measures to keep the yen weak. Data from Japan has also shown some improvements, indicating that the BOJ might soon move closer to tapering their asset purchases. Lastly, the risk-off environment stemming from Greece’s IMF default and speculations of a Grexit could continue to weigh on higher-yielding currencies like the Kiwi. I’m inclined to sit on the sidelines ahead of the Greek referendum and potential volatility from profit-taking ahead of the Fourth of July long weekend, so I’ll be setting my actual orders early next week. I’m eyeing a potential short entry on a pullback to the broken neckline around 84.00 to 84.50, and I’ll have a wide stop for this forex setup. My ultimate profit target is around the next major support at the 75.00 mark, but I’ll be ready to lock in profits along the way. What do you guys think?